Keep your guests humming through the intermission. 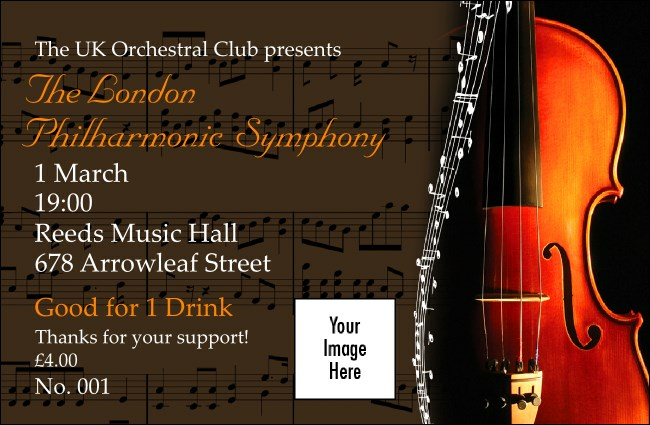 Part of our Symphony Event Kit, this drink ticket lets you sell drinks in advance or treat your favourite fans to one on the house, with a smart violin and sheet music image. Tune in to event sales with tickets for every occasion from our online gallery of designs and ticket templates. We'll never string you along! UK Ticket Printing guarantees fast, accurate orders.